We often include spices in our Hygge boxes because not only are they the variety of life but they can evoke memories, often have health benefits and nearly always smell divine – one of our “Original Hygge Box” rules. So when we kept seeing turmeric pop up on our instafeeds and in cook books, we knew we needed to give it a go beyond the usual curry ingredient. 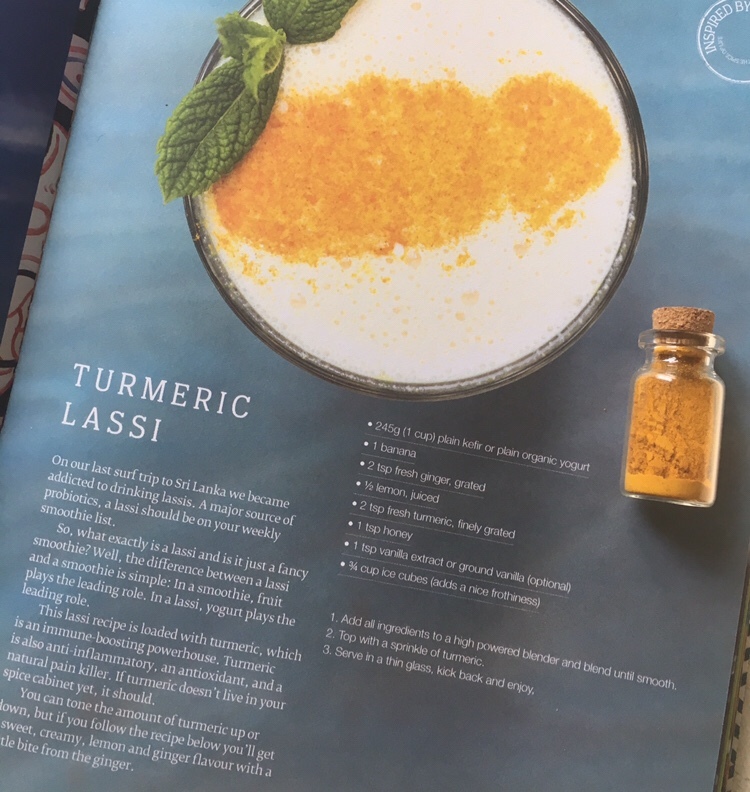 We set about creating this Turmeric Lassi as featured in Good Vibes cookbook by Jane and Myles Lamberth. A lassi is a Sri Lankan inspired smoothie where yoghurt plays a starring roll instead of fruit. When loaded with turmeric, the recipe claims it’s an immune boosting powerhouse, anti inflammatory, an anti-oxidant and natural pain killer. It’s really easy. Basically, take one cup of yoghurt or kefir and blend it with one teaspoon of honey, one banana, two teaspoons of fresh ginger, half a squeezed lemon and two teaspooons of turmeric. The recipe recommends fresh which we didn’t have, but we used the powdered form. Blend with ice. It really was a doddle to make in our blender. It looked appetising too with a sunny yellow hue. First impressions on taste and the jury was out however . A real mixture of yoghurt soury-ness that “tacks” around the sides of your tongue, with the zing of lemon and ginger and the earthiness of the turmeric I wasn’t sure… but a couple of sips later and it became really quite pleasant. That may have been the smugness of feeling like I was downing something quite healthy. I can’t confirm whether it is a natural pain killer and I’m sure fresh turmeric is far better than it’s powdered form but it’s definitely a good way of getting healthy goodness inside your insides. Will definitely have another. I’m off for a couple of hours of netball training now… the monster munch that I had afterwards are sure to be a winning combo!